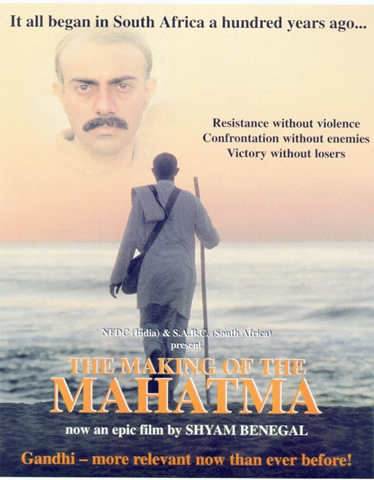 Tonight, I watched the movie, The Making of the Mahatma. While the movie was released in 1996, thirteen years later I’ve finally gotten the chance to watch it. This movie is completely focused on Gandhi’s 21 year stay in South Africa from 1893-1914, from ages 23 to 45. It is here where he begun his methodology of satyagraha (devotion to the truth), or non-violent protest. Jointly produced by South Africa and India, it isn’t as widely known as Richard Attenborough’s legendary 1982 movie Gandhi, but it is pitched as a more intimate portrayal of the beginning of Gandhi’s transformation into a force of social change. I haven’t watched Attenborough’s Gandhi movie for many years (I own a VHS tape of the movie, but with the rapid change in consumer technology, I don’t even have a VCR connected anymore) or read Gandhi’s autobiography recently (which I had read parts of years ago as well) so I don’t have a fresh recollection of many of the details of Gandhi’s time in South Africa. Most are quite familiar with Gandhi’s lifetime of achievement, so I’m not going to rehash the commonly referenced parts of Gandhi’s life, but I’d like to comment on some of the anecdotes, phrases, or events portrayed in The Making of the Mahatma that I found noteworthy. Early in the movie when Gandhi first arrives in South Africa in 1893 (at age 23), he states he didn’t know much about his own Hindu religion. He is shown reading an English translation of the Koran in 1893, as he starts to learn more about all religions, not just his own. On a return trip to S. Africa from India, the ship he and fellow Indians are on is quarantined for 26 days, kept at the harbor that long as the local South Africans of Natal mobilized to keep Indian immigrants out of Natal. He and his wife are shown having an up and down relationship; with his wife Kasturba not always fully aligned with Gandhi’s ideals of equality for untouchables, detachment of possession and self fulfillment. Likewise, he is shown having a rocky relationship with his son, not committing to his son’s higher education but rather focused on his goals of helping the local Indian community. Gandhi showed admirable courage, before his efforts of satyagraha begun, when he was a lead volunteer in treating Indians affected from the spread of the contagious plague in a settlement of Indians. When the British got into conflicts with both the Boers and the Zulus in separate conflicts, Gandhi stressed to the Indian community the need to support the British in these conflicts; being Indian, a colony of the British empire, it was their duty to support the British. Through this support, he was led to believe some of the repressive tax policies and personal identification registration policies would be changed, but was ultimately lied to with no changes until 1914. While not fighting on the battlefield with the British, Gandhi led a group of Indians as medical stretcher operators who transported wounded soldiers from the battlefield. It is while performing these duties that his feelings about the British and support of them in these battles start to soften. Gandhi consistently demonstrates fearlessness and courage as he asks for the maximum jail sentences for himself from judges during his appearances in court. Overall, it takes 21 years for policies towards Indians to change in South Africa, driven by Gandhi’s leadership. Social change takes time and Gandhi had more patience than most, as do other social change icons such as Martin Luther King, Jr. and Nelson Mandela. Overall, watching this movie is a needed reminder on the legacy of a monumental man, and a motivator to treat our own behaviors as a force of social good in today’s times. Nice post. Watching this movie is a moving and powerful experience. yes, definitely a powerful experience and one I’ve been thinking more about since watching it and tying it back to recent books I’ve read and experiences I’ve had in India.